Signs of luminescent material (thickness 1.1 mm) for use in combination with our Man in room alarm. 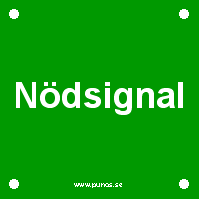 The sign "Nödsignal" is mounted inside the refrigerated space and informs where the emergency signal button is located. They are mounted with 4 screws or the like, one in each corner. It has external dimensions 70x70mm and its mounting screws have 60x60mm between holes.